Joseph Kemp Starley was living at 10 Gloucester Street, Spon End, Coventry at the time he developed the Rover Safety Cycle. The house is still standing and there is a campaign to have a plaque placed on the property. 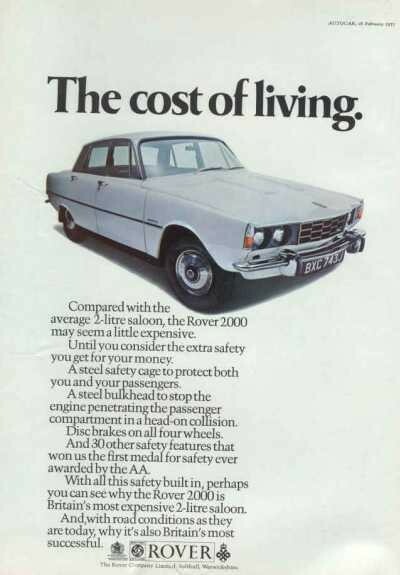 When it comes to Rover there has never been too many different models on the market. One reason, I have been told, is that Rover guard their designs and has not allowed many firms to make copies. If this is true or not, I can't say, but the fact is that today several new models built on well-known Rover designs are entering the market. One of these companies is Brooklin Models in Bath, UK, which has made models of P3, P4, and now the latest being P5 - but at a cost. The models are extremely detailed and fine, and pricy. They ask between 700 and 800 SEK (about 100US$) for each model. 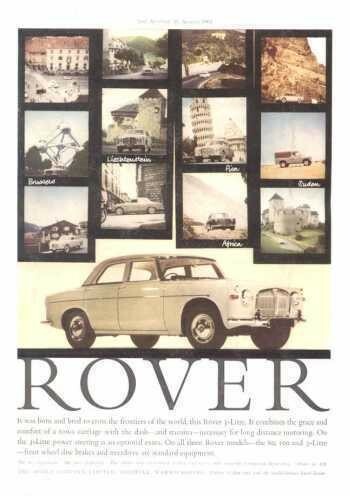 I have not yet found any models of older Rover cars. 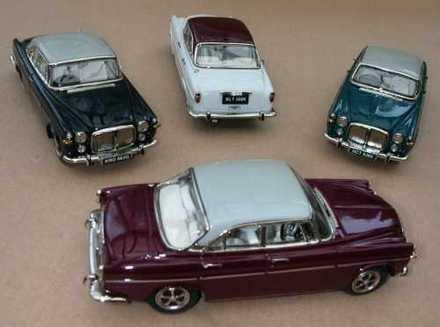 Dinky Toys produced for several years models in 1:48 of the P6, rally as well as P6 with the large Sundim glass roof. Highest price is for mint condition (unplayed) and with the original cardboard box. From 250 and up to 800 SEK (30 to 100 US$) are usual prices for thse cars. Dinky Toys also made a number of variants of the SD1 when that was still produced by Rover. The Spot On Company made a fabulous P5 model. This company produced extremely welldone models and their prices were high. If you find one today in good condition the seller would problably ask between 100 and 150 US$ for it. Still I have missed a P6 model with the "new look," or if you like the late P6 with bumps on the bonnet and the black fronting. Recently I found an advertisement in "P6 News" about plastic models of the P6. Curious as I am, I decided to try even though the price was quite high, on the other hand cheap compared to built models, and below you can share my experiences. The scale is 1:24, which makes the model 18 cm long, and all the three variants, 2000, 2200, 3500 can be built. If pay a little more, a spare wheel for the boot-lid is available. The company making this model is Outhouse Models, 9 Skerne Road, Driffield, East Yorkshire, YO25 7SE, ENGLAND. Phone: 01377 241324. The English instructions start by stating "This model is for adult collectors only and is not a toy. It is not suitable for children." This is all true, because this is not a starters model that any 7-year-old can put together in an hour, not with a good result anyway. About 20 parts doesn't sound much, but consider that this is not a mass-produced Airfix model. The first problem is to retrieve the different parts from the molds in decent order, a pretty tricky task. These models demands it's share, but returns much by giving the builder, through the scale, lots to improve. The model is of course equipped with R/H steering, but I do believe that some careful carving can provide a L/H side vehicle console if wanted, I never bothered to try. The inside front-door handles have to be cut some, since the model is molded with those from the 3500S, the manual P6 V8 that is. 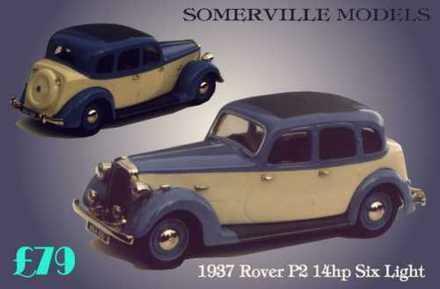 The model can be seen as a little bit primitive if compared to the products of larger manufacturers, BUT it is a Rover and has charm and excitement which I have not seen with the established ones for a long time. Total cost including freight from England totaled UK£ 44.95, but the pleasure of making a model was worth it. A warning should be made, and that is to take your time to get the model built, it is worth it. This text is an excerpt from the Club Magazine published in June 1997. He has some very fine cast and polished aluminium models of various models, about 1:43 scale. The quality and accuracy are OK, and the price, about £20.00. Martin Kennedy in the UK sells carmodels online. You can contact him via mail,. Matchbox has made both Sterlings and SD1's. The SD1 was current during the early 1980's and was produced in both stock and police forms. The Sterling was more recent, and may in fact still be in production. All are pretty easily available in collecting circles and aren't too expensive. The SD1's are probably $10 to $15 each at most, the Sterlings probably just a couple of dollars. Corgi also made a Matchbox-size SD1 in their "Corgi Juniors" range, again in both standard and police form. Again, these should be pretty cheap, in the $5 range. This modelmaker is willing to produce models of almost any car if they get five orders. 9 Skerne Road, Driffield, East Yorkshire, YO25 7SE, ENGLAND. Phone: 01377 241324. Here is a photograph of a new model by Somerville Models. It is 1/43rd scale P2 and built in white metal to a very high standard. Apart from these colours, it is also available in black over red with black wings, and dark green over mid green with dark green wings. Because it is handbuilt, the price is a little on the high side (£79). Is a UK company making replicas of fine cars. 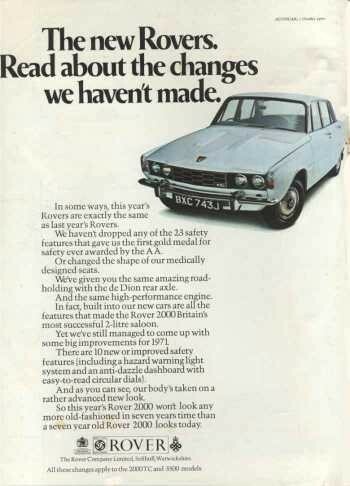 They have four variancies of the Rover P6 at the moment and the prices for a kit is about £28. The built models cost £74. You can see the models at the K & R homepage..
British company that builds detailed car models. Includes interior. The buyer may get the car in preferred colour. New from Kenna is Rover P5B Coupé at a price of £95 including UK postage. Se the models at their website..
As served at "The Rover Pub" in Göteborg. Spices: Salt, Pepper and Paprika. Mix together the ingredients thoroughly and form into a burger about 10mm thick. Grill the burger thoroughly. Serve on a plate in a pittabread, with coleslaw, together with chips (or French Fries if you're American! ), a little salad and some sliced tomatoes. Also serve with a little red salsa sauce to dip the chips in. Q Should I install a crane electronic ignition to my Rover? A. No. Cranes, which are used to lift very heavy things (like Austin-Healey engines), have motors that operate at very low RPM's; the advance curve would be wrong. Q My Rover won't start and I suspect the fuel pump. Help! A. This is common on British cars, and will provide you with many happy hours spent with your Rover. American cars do not have this problem, it seems; the rear of the Yank cars are raised so high that the fuel tank is above the carburettors, which are then fed by gravity, thus not requiring fuel pumps. 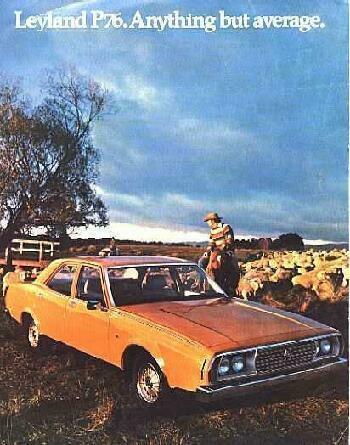 Q I have an 1970 P6B Rover for sale, red, 61 K miles. Anyone interested? A. Not anymore. The fact that you, like most everyone else, didn't put a location in your message, did not stop us from finding out that you and your car are in Sri Lanka. A lovely island, to be sure, but nobody wants to pay the $15,000 in freight to get the car back here. Q Is my brother-in-law's car's name pronounced "Jag-wahr" or "Jag-wire"? A. Well, you are correct in that it's two syllables, but is sounds more like "bring-cash". Q What's the best way to keep my Rover from rusting? A. Having NASA loft the car into a polar orbit should be effective, but you wouldn't be able to drive the car. You should get most of the benefits, including not being able to drive the car, by building a dehumidified garage and never taking the car out of it. 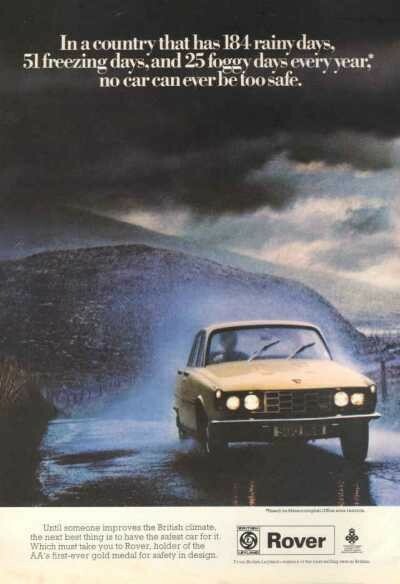 Q If I could afford a dehumidified garage, I'd be driving a "Jag-wire", you fool. Now what? A. Buy a Daimler SP250 and leave it in the driveway. Even if your neighbours drive current-generation Tauruses and Citroens, they'll be offended enough by the eyesore that they will take up a collection to build a garage for you. 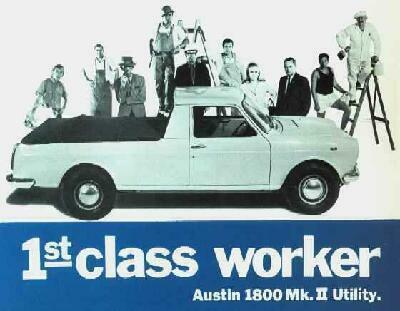 If another neighbour brings home a Trabant, however, then you've been out-bid. Q Can you recommend a good, reliable, mechanic that services Rovers for reasonable rates? A. Sorry, wrong List. Send a 'subscribe' message to gullible@naive.com, they should be able to help you. Q I'm looking for a MIG welder at affordable prices. Where should I look? A. Try the Russian Air Force; current price is two pairs of blue jeans and they'll throw in a Trabant to use as a welding cart. BTW, welders designed for cars work almost as well. Q I do not understand the animosity on the List towards Miatas. Should I trade in my Rover on one? A. Not a good deal from a financial standpoint. All of the money you will have spent so far on engine hoists, sandblasters, MIG welders, bearing presses, etc., would have been wasted. Keep your Rover so that you get a return on your investment in these tools. 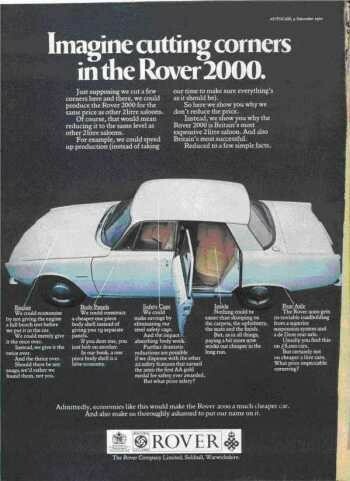 Q Should I keep my older Rover perfectly original, with no modern "enhancements"? A. Absolutely. Scrounge the junkyards for 30-year-old gas out of the tanks of cars wrecked long ago. Finding vintage air for the tires might be tougher; exhuming the dead to pump air from their lungs is frowned upon. Fill the glove box with antique unpaid parking tickets, most drivers in major cities have plenty of these. Old brake fluid is easy, as most of us on the List have many half-filled cans left over from previous brake jobs, and we'll be glad to sell it to you. BTW, check out the List from your Univac computer with a baud rate of something like five or six. Q What does MOWOG mean? A. Nothing. The man who made the wood forms for the castings liked subtle practical jokes. Q Should I use silicon break fluid in my car? A. Of course. Since silicon is essentially sand, it does not absorb water as readily as standard brake (note spelling for future reference) fluid. It is easy on paint, provided you don't blow it at the paint at high velocity, or stick it on paper and rub it across the paint. Q. I have read that rubber break seals swell up in DOT 3. Is that right? A. Yup. Look like gummy bears in a day or so and leak like crazy nuts. In DOT 5, on the other hand, they don't swell up quite enough, and still leak like crazy nuts. In DOT 4, however, they swell up just enough. It is called the Goldilocks principle. Interestingly, gummy bears soaked in DOT 3 are perfectly preserved, but they taste terrible. And for future reference, it is brake, not break. Q Is it true that you should not store batteries on concrete? A. Nope. It is perfectly O.K. to store batteries on concrete. It is not considered proper, however, to repair the rust holes in the battery tray of your car with concrete. Take it to a body shop and have it repaired properly with aluminum and rivets. Q Has anyone heard of this Moss Motors place? Q What size tires should I put on my Rover? A. Use 195/70 SR 14 on the driver's side, and 175/70 SR14 on the passenger's side. This combination compensates nicely for the different settling of the springs on the two sides. Do not get confused and put the two larger tires on the front; the constant struggle to go uphill will substantially reduce performance. Q What colour white should I use to match my original paint? A. 94 subtly different whites were used on Rovers. Most people give up and paint their car Porsche red. If you are trying to match the original paint with Davos White and have a problem, consider the possibility your car may have been originally April Yellow or Zircon Blue. It may be tough to get an exact match to either of these with Davos White, but it should be close enough for most practical purposes. Q On my way to work today I saw 6 Miatas with their tops up. Why is that? A. It is not well known, but the Miata isn't actually a convertible. It has a fixed head, cunningly covered with cloth to resemble a convertible, like many Lincoln Town Cars. Any you see with the top actually down are custom conversion jobs. Q I have a really bad leak from my gas tank. Is it O.K. if I get some plumber's solder and a propane torch and solder up the hole? A. It's O.K. with us. In the interest of preserving your car for future generations to enjoy, remove the tank first and perform the soldering operation some distance from the car. Adios. Q My car overheats all the time. My mechanic said the water is moving through the radiator too fast to get cooled off. Is this right? A. Well, although it makes no physical sense whatever, racers and mechanics everywhere agree completely that one way to improve the cooling of your car is to slow down the flow through the radiator. Many owners swear that this has worked for them. 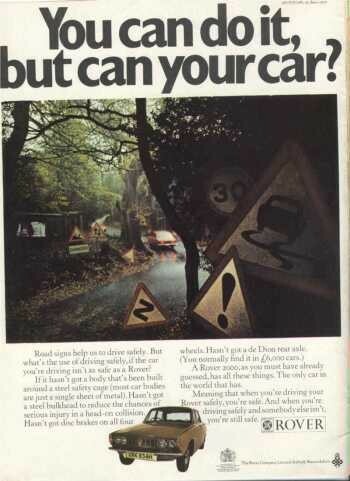 British cars, it seems, are so nearly human that they succumb effect. It is probably worth noting that the owners of British cars are nearly human, too. These brochures come from the collection of Kurt Christensen in Denmark. Danish Christian Helmer has a collection of about 1200 Autocar magazines from 1937 to 1976. 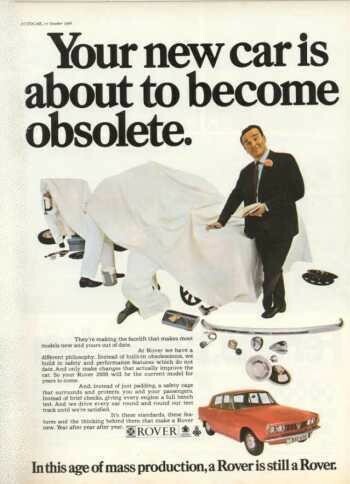 He has been kind to scan some old ads for us to see. I do know that some of the longboats plying the klongs in Bangkok, Thailand are definitely Rover V8 powered. For those who haven't seen these - or better still, experienced a ride on one - these are long but narrow wooden boats seating up to perhaps 10 or 20, used as water taxis on Bangkok's internal waterways. They are home-made efforts and are powered by an amazing assortment of ex-car V8 engines on a pivoting gimbal mount in the centre of the boat. The engines are at about driver's head height and the propeller is at the end of a long shaft sticking over the back of the boat; a handle is attached to the engine and the driver steers the boat simply by swivelling the engine on its mount! Very noisy - no exhaust system, you understand - and exhilaratingly fast! Would definitely be banned on London's Thames river (speed limit 4 mph). I think I've got a photo of one of these at home - I'll upload it to my web site later if I can find it. Go to www.boltblue.com and download a Rover Logo and wording for your mobilephone. After registering, visit the "Fun & Games" section for hundreds of phone logos and ringing options. Then everyone can see that your phone is very special with the great "ROVER" logo displayed on the screen. The first Rover jet engines were never built! Rover was given a shadow factory by the UK goverment to produce the Whittle engine and was getting no where partly because they refused to work to Frank Whittle's specification for the first version. The early Whittle engines had an apparently illogical design with the centrafugal compress facing the wrong way round. This meant the intake air flow had to go through to U bends before reaching the combustion chamber. This was inefficient but adopted as an interim measure by Whittle to get a working design into production while a "straight through" design could be proven on the test bed. Rover took it upon themselves to redesign the whole engine and held production up for over a year, not even managing to produce enough engine parts for Whittle's Power Jets operation to conduct a test cell program to clear the engines for flight. As a result the Power Jets test programme depended on engines they were producing themselves. 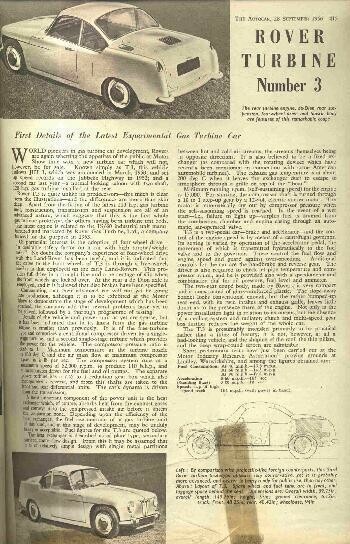 When Whittle got word of what was going on at Rover he put pressure on the Ministry of Aircraft Production as a result that De Haviland, later Vauxhall, were brought into the picture at a very late date in the story both of whom very quickly got things moving. De Haviland quickly designing and producing the Goblin and Vauxhall would have been ready to produce complete engines had it not been for the end of the war. 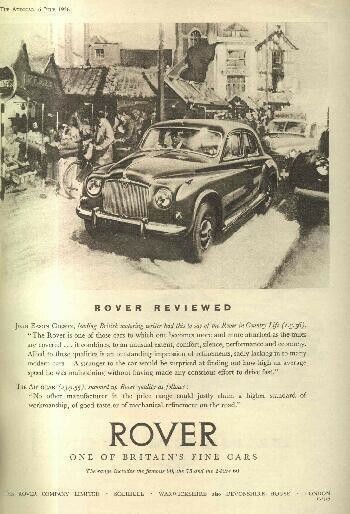 Rover were never Whittle's first choice to build the engine, that was Rolls-Royce. However they were banned from taking part in the program because Lord Beaverbrook realised the vital importance of the Merlin and Griffin engines to the air war against Hitler. However Hives, later Lord Hives, realised just how important the jet was and had links with Wittle because Rolls were making components for Power Jets test engines (because of Rovers non-production of vital parts). Rolls were also made a major input to solving the metalurgy problems that Whittle encountered and the design of the compressor section which was based on Stanley Hookers Merlin supercharger data. Eventually Hives got the nod from Beaverbrook to do something about the jet engine production programme and swapped the factory set up to produce the non uppercharged Merlin tank engine (later renamed the Meteor and in V8 form the Meteorite) for the Rover jet engine plant. Rolls very quickly got the initial Welland into production working to Whittles drawings, and this was quickly superceded by a straight through version designed by Whittle. An enlarged version of this robust engine, called the Rolls-Royce Nene, was produced in large number under licence in the US and without licence in Russia and China. It was used by both sides in the Korean and Vietnam wars and is still used in some combat aircraft in mainly 3rd world airforces. 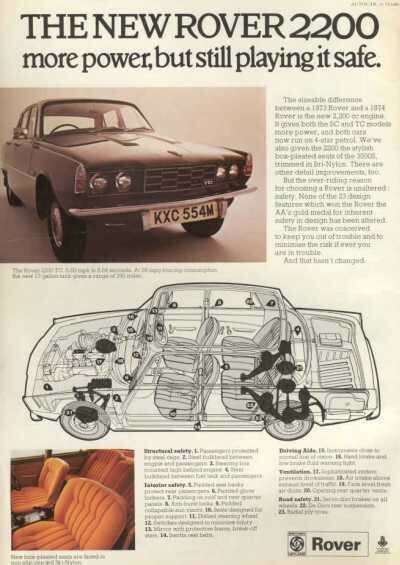 Anyone that has been travelling in a Rover P6 knows for sure that the seats are excellently comfortable. But do you know that you can buy such a seat ready for use in your livingroom?!! They're not cheap though. In fact it's a piece of modern art, and you usually find these seats in museums and artshops. This one I found in an artshop in Gothenburg, Sweden. It was the British artist Ron Arrard who designed them, and he made them as armchairs and settees. Have a look and enjoy! Christoff Brock in England made this table of a Rover V8 engine. Then this became the destination of the mockup block (this was intended only for measuring up the body and chassis). I'm a Lotus fan and have own 3 pieces. Also British and I like it because British cars are rare. Britannia rules . . .
Only in Britain... do Supermarkets make the sick people walk all the way to the back of the store to get their prescriptions while healthy people can buy cigarettes at the front. Only in Britain... do we leave cars worth thousands of pounds on the drive and put our junk and cheap lawn mower in the garage. Only in Britain... do we buy hot dogs in packs of ten and buns in packs of eight. Only in Britain... do we use answering machines to screen calls and then have "Call Waiting " so we won't miss a call from someone we didn't want to talk to in the first place. Only in Britain... are there handicap parking placed in front of a skating rink. Every Rovernut should go to Russia to get that long-wanted handheld PC. 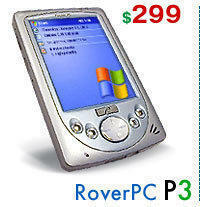 In Russia you can choose between the P3, the P5 and the P6 handheld all running Microsoft Pocket PC OS. And there's a lot of peripherals to add value and versatility. The UK number plates are confusing. Since 1972 it has been compulsory to have reflective white plates at the front and yellow at the rear with black numbers and letters. 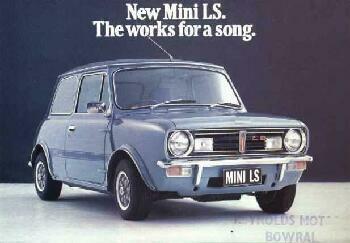 Before that plates were either silver or white letters on a black background both front and rear. 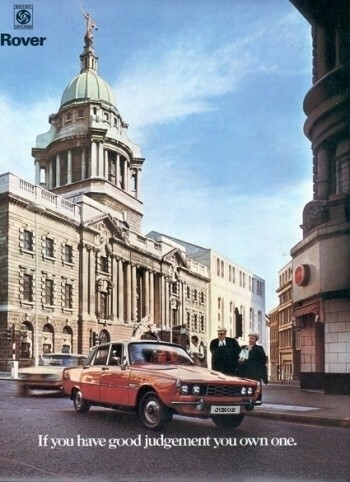 Cars made before 1972 (?) can choose to have either colour plate, but I must admit I think an early car with reflective plates looks totally out of keeping. From 1963 you could tell the year of a car by the fact that 63 had an 'A' suffix after the number (ABC 123A for 63, ABC 123B for 1964, etc.) with two of the letters denoting the area the car was from originally (here in Denbighshire UN was area letters). When they reached Y (there was no Z or I, so as not to confuse with two or one) they started in reverse (A123 ABC). Then things went stupid and they started changing suffix twice a year, and finally changed the system entirely about 5 years ago to something I can't understand and is so complicated nobody can remember. Herewith, for your enjoyment, a slightly updated version. for these persons are family to you. nor upon any who stray into the path of thy Rover. 7. Thou shalt not treat thy Rover better than thy spouse, lest thy spouse leave thee penniless and unable to afford additional Rovers or repairs upon thy present Rover. 8. Thou shalt not steal a Rover (except for an agreed upon price). 9. Thou shalt not bear false witness concerning the condition of thy Rover when offering it for sale, nor about the number of miles thou travelest upon one gallon of petrol, be it US or Imperial, nor about the velocity which thou wast recently able to attain whilst proceeding upon the motorway. 10. Thou shalt often tell thy Rover owning neighbor that thou dost greatly covet his Rover, so that the smile may long remain upon thy neighbor's face. This picture, and others alike, has been frequently published during the recent years. Often as evidence of how few cars MG Rover Group has sold. The truth is that most, if not all, British car manufacturers and importers use these airfields for storing cars during the distribution process. I think this picture show the airfield in Upper Heyford, in Oxfordshire, which is distribution centre for a company that stores and distributes cars for several manufacturers. Unless this picture was taken in 2004, or earlier, there are probably very few MG:s or Rovers on it, more likely Citroen and Peugeot. These airfield photographs are a regular newspaper nonsense - what the journalists can't get their tiny minds around is that a car factory can turn out thousands of cars in just one week. If you actually count the blobs, you'll find that even a full airfield only represents a couple of week's production. They have to go somewhere during the distribution process, which can take several weeks in itself. 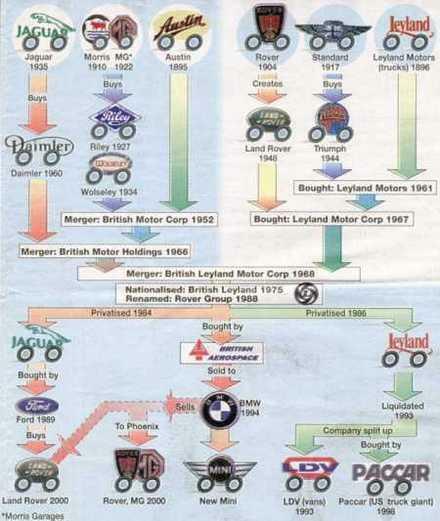 On 4th November 2005 the administrators for the MG Rover Group, PricewaterhouseCoopers, stated that they had sold 6,750 MG Rover cars since April (they outsold Jaguar in August !) and they reckon that once the ownership issues have been settled, they have about 300-400 still to sell. There were quite a lot of cars in limbo, where ownership isn't clear, because transactions with banks and dealers were halted in mid-flow. ...that tiny radio plates the size of a rice grain will be attached to honey bees to detect antipersonnel landmines, of which there are about 100 million in 70 war-torn countries.